Please join us for Walt Whitman at 200: The Bicentennial Symposium. Click here for the full listing of symposium events in April, May, and June. Walt Whitman at 200 is made possible by a grant from the Arts and Humanities Initiative (AHI), Office of the Vice President for Research, University of Iowa. 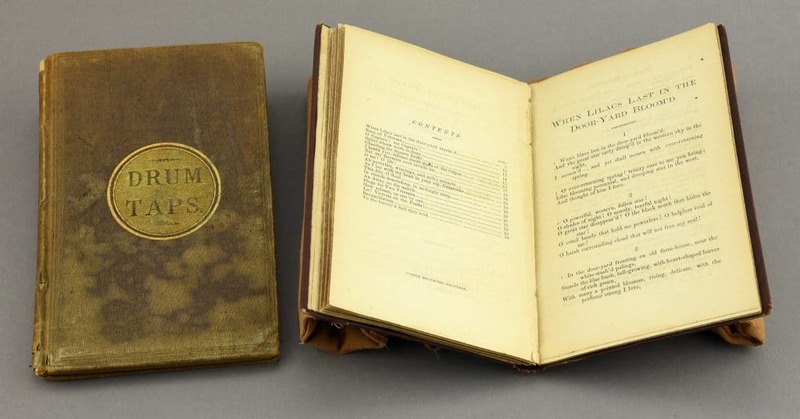 Throughout the 1840s and 1850s, Whitman wrote poetry with conventional rhyme and meter and popular fiction that ranged from moral and sentimental tales to stories focused on race, gender, sexuality, and national identity. In total, Whitman first published over twenty poems, twenty-six short stories, and two novels in New York newspapers and magazines by the early 1850s. Drum-Taps. New York: Peter Eckler, 1865. Whitman’s volume of poetry Drum-Taps (1865) traces his evolving emotional responses to the Civil War, during which he volunteered as a caregiver in Washington. D.C. area hospitals. According to his own estimates in Memoranda During the War (1876), he made 600 hospital visits offering care and comfort to between 80,000 and 100,000 soldiers. 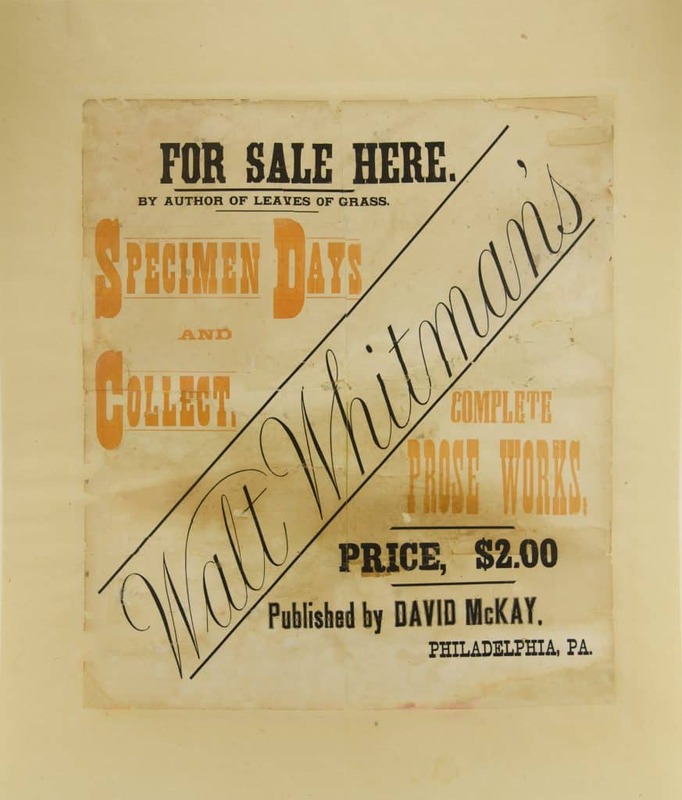 In Specimen Days (1882-83), a semi-autobiographical work, Whitman recounted his years in the hospitals, and the health problems he developed in the aftermath of the Civil War. 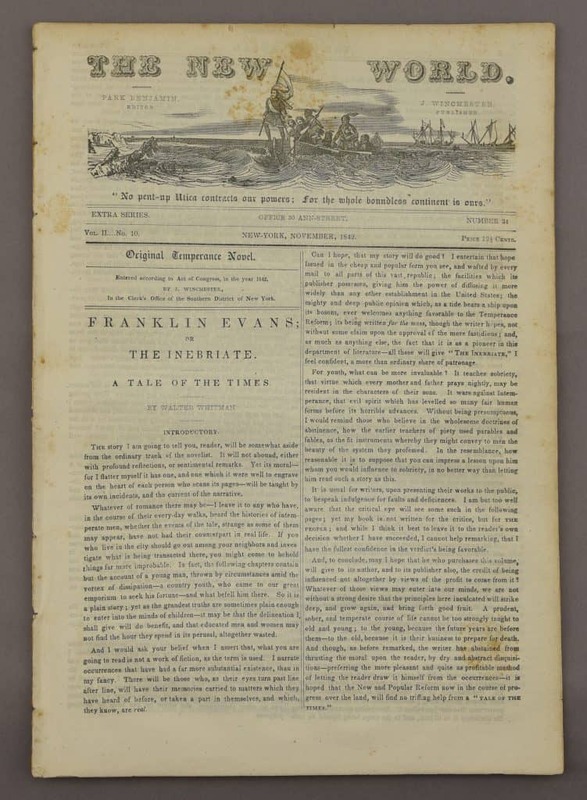 More about David McKay, Whitman’s final publisher, on The Walt Whitman Archive. 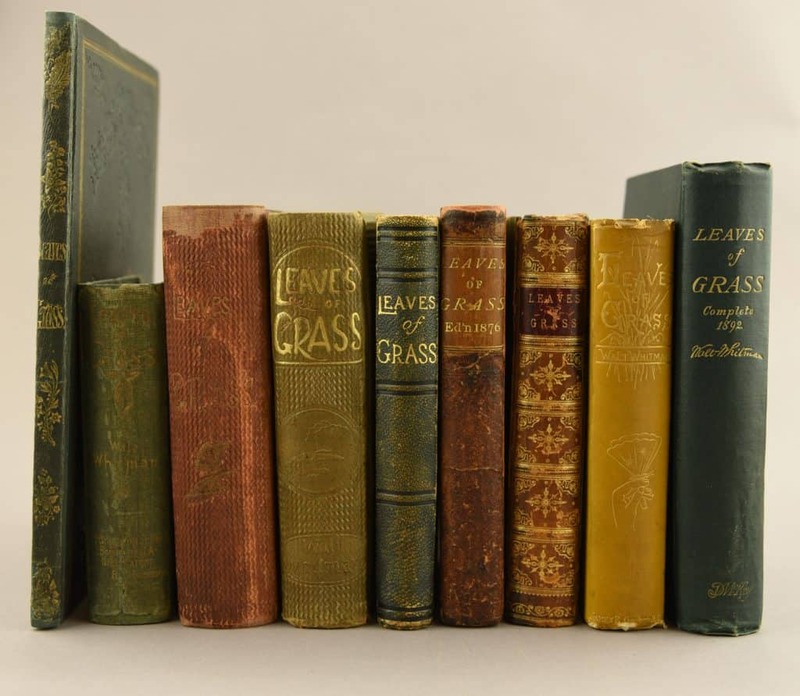 Editions of Leaves of Grass dating from 1855 through 1891-92. Now considered a foundational text in US literature, Walt Whitman’s Leaves of Grass went through multiple significantly revised editions in his lifetime. 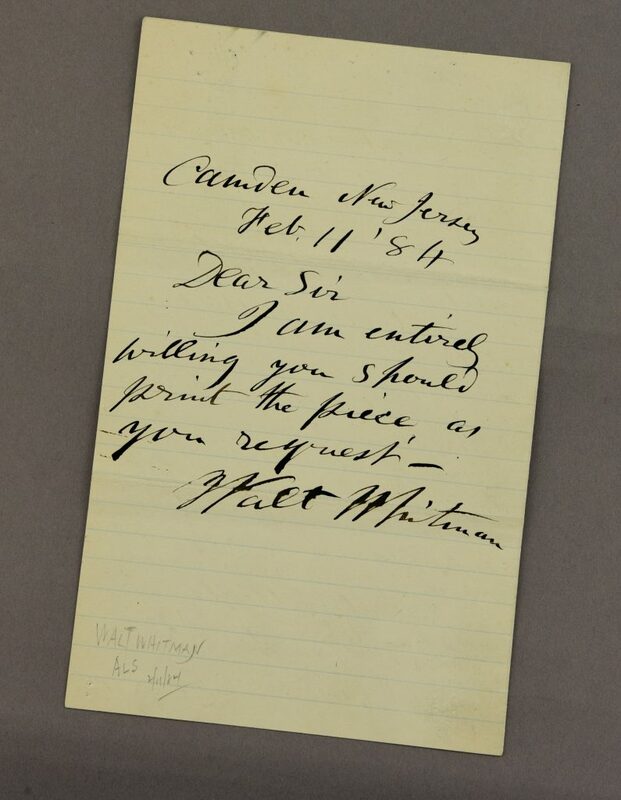 Letter from Walt Whitman to ornithologist Thomas Gentry (1843-1905), February 11, 1884, responding to Gentry’s February 8, 1884, letter. Whitman was a prolific writer, not only of fiction and poetry; thousands of letters and manuscripts in Whitman’s hand are in public and private collections around the world. This exhibition features an assortment of items handled by Whitman, including a manuscript on Ralph Waldo Emerson, a postal card to the naturalist John Burroughs, and a letter to Philadelphia ornithologist Thomas Gentry (pictured here). Throughout his literary career, Whitman understood the importance of visual representations of himself in selling his books. 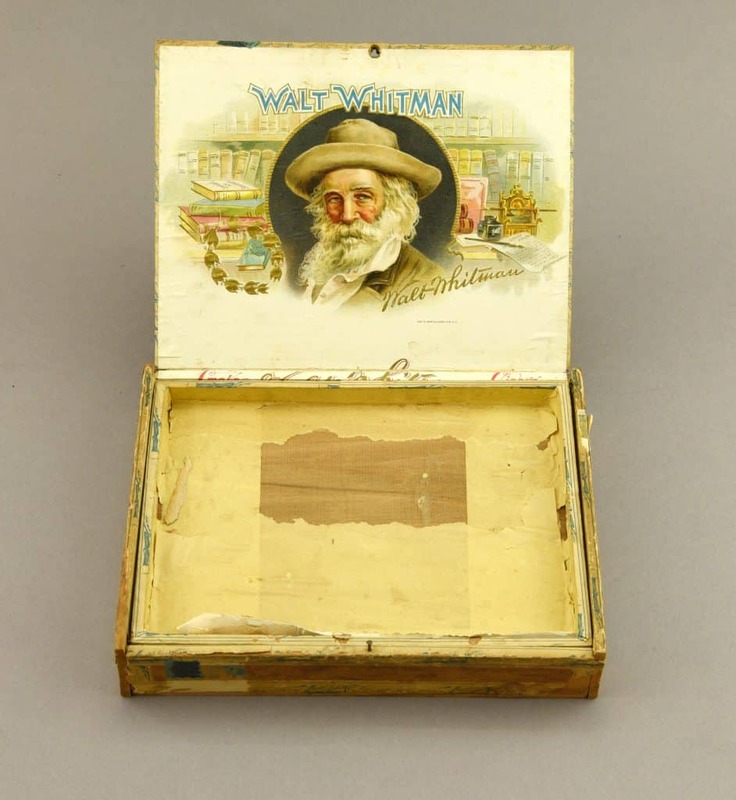 Following this example, souvenir producers and commercial manufacturers saw value in reproducing Whitman’s name and likeness during and after his lifetime. Cigar boxes, beer bottles, an entire line of canned food, and T-shirts are just a few of the places where fans and readers have encountered the Whitman brand, ensuring that Walt Whitman remains a recognizable name and face nearly 130 years after his death. Download a list of all the items featured in the exhibition (PDF).